Do you feel consumed by your grief? Do you feel like you have lost control over your emotions? Do you feel full of hopelessness and despair? Are you constantly questioning “what if” replaying the timeline over and over again in your head? Or was it the loss of a relationship or a job? Grief is an unfortunate part of the human experience. Everyone will experience grief at some point in their life and everyone will react to it differently. There is no right or wrong way. 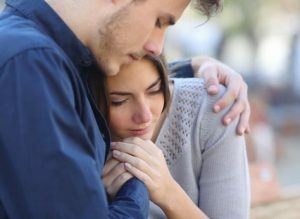 Overcoming grief takes time but sometimes the affects of grief can linger for too long, leaving too heavy of an impact on our lives. Learning how to cope effectively with grief is crucial for our mental health and quality of life. In the first stage of Somatic Experience (SE) Therapy for grief, Robin will work to assess and help you gain more self-awareness of how your body is dealing with the grief. You may notice that you are getting stuck in highly activated states (anxiety, anger, guilt, sadness, inability to control your emotions) or that your body is experiencing more of a shut down state such as heaviness, numbness, blank mind, brain fog, overall blah feeling, and a sense of hopelessness or despair. Once your grief state is identified, she will help you connect your own internal resources for self-regulation to help you regain control over your body and mind. It won’t take long for you to learn how to identify and move out of shutdown physiological states so you can feel more clear minded, happy, and have more energy in your body. You will learn how to bring your body into a more relaxed state and gain a sense of safety, security and well-being. Once you feel stabilized, the second stage of grief healing can begin. This phase of therapy engages the grief so it can be processed. Robin always maintains a safe space and will slowly titrate into the emotions. For example, imagine that your grief is a big ball of elastics and the ball is so big that it’s stuck inside of you and it can’t be released. Robin’s method of untangling the grief is akin to taking off one of those elastic bands at a time so that you safely feel and release the emotions slowly. Each elastic corresponds to an emotion that grief is holding onto (sadness, anger, guilt). One by one the elastics will be safely removed and the activation energy from the adrenaline response will be released. After this is completed your body will be restored to a new sense of equilibrium. You will also experience an increased ability to deal with emotions and stress as well as increased skills and ability to deal with any future grief or difficult life events. It won’t happen overnight, but if you are committed to healing than the process will take just as long as it needs to and not a second longer. Release the pain and sadness of the grief so that you can once again live live life to its fullest potential – schedule a consultation.